We have striped rugs to suit every taste, from red to black to white and every colour in between! Our striped rugs are a great alternative to the more traditional patterns and designs. 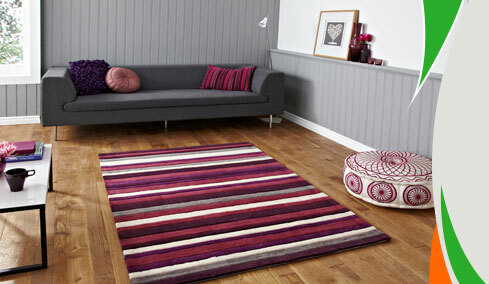 Striped rugs have become noticeably popular recently as more people are ready to try out the new designs on offer. They instantly become a focal point in any room with an otherwise plain décor. A striped rug is designed with simple parallel lines, but the different colour combinations accentuate their looks and ultimately your room; giving it a modern homely feel. There are various styles and types of striped rugs available within our range; you can find a shaggy striped rug as well as a flat weave rug to go with your furniture and room ambience. A general feeling is that a striped rug is associated with a contemporary look, however, these types of rugs can be used in a more traditional setting as well. Striped rugs have a unique versatility of blending with all types of home décor. The key to achieving the perfect look is to choose a striped rug with the right colour combinations to enhance the look of your room, choosing colours that are already used in your room will help complement rather than make a bold statement. Natural colours, such as cream, grey and brown tones create a calm and relaxed atmosphere. A colour scheme of blues and greens give an ocean feel and offer a sense of serenity; whereas a colour scheme of reds, yellows and burnt oranges offer an earthy and warm feel. Striped rugs are perfect for children’s rooms, bringing bright colour combinations to the room.